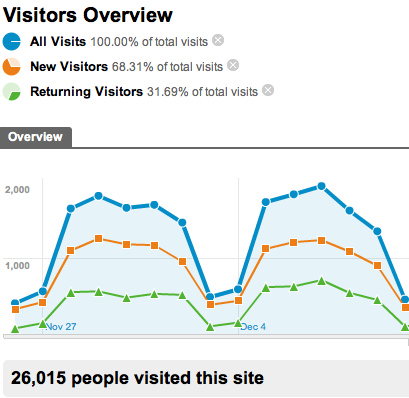 Welcome to our free Advanced Google Analytics tutorial. This tutorial is based on Webucator's Advanced Google Analytics course. In this lesson, you will learn the fundamentals of advanced segments and how to apply them in your account. How to Build Advanced Segments. 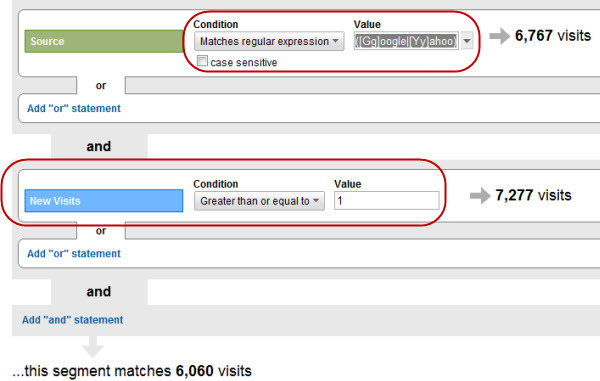 Advanced segmentation allows you to include visits that meet a specific set of criteria. This may sound similar to creating a filter, however there are fundamental differences in the way filters and advanced segments act on your data. To quickly isolate and analyze subsets of your traffic. To slice and dice your historical as well as real-time data in a much simpler way than creating a filter. Advanced segments act on historical data. Filtered profile will act only on the traffic going forward. Advanced segments produce immidiate results, you don't have to wait for your results to show. You have to wait for your results to check if the filter is applied properly. Advanced segments are portable i.e. they are available across all of your accounts and profiles. Filters are account and profile specific. Advanced segments do not alter your data permanently. Filters permanently affect the data coming in a profile. 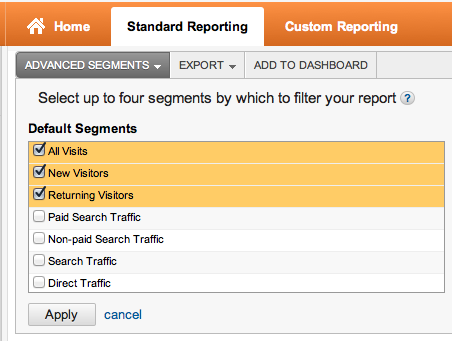 You can compare up to four advanced segments side by side in your reports. Filtered profiles can only be viewed one at a time. At the top of your reports you will see the pull-down menu labeled as Advanced Segments. When you click on it, you will see all the default segments available to you in that report. Check off the segments which you wish to create and then click on Apply. Take a look at the following example; we have selected All Visits, New Visitors and Returning Visitors for segmenting our data. In the following screenshot you will see that all our tables will reflect this segmented data (e.g. 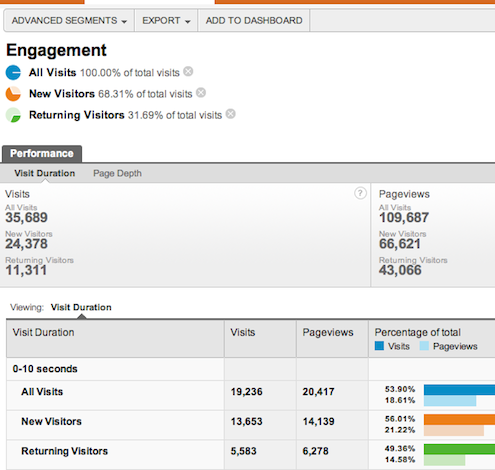 Overview Report is segmented using All Visits, New Visitors and Returning Visitors metrics). You would like to find out what effect different traffic sources have on the amount of time visitors spend on your website. Accomplish this task using advanced segmentation. Select the Behavior report and then click on the Engagement report. At the top of this report you will see the pull-down menu for Advanced Segmentation. Check off the following segments, Search Traffic, Direct Traffic, Referral Traffic. 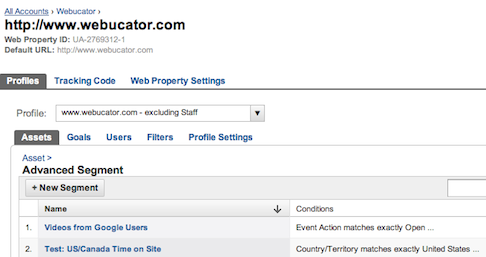 (The All visits parameter will get selected by default). Click Apply and you will see these four segments are applied to all the default reports available. Customized advanced segments are based on logical statements (i.e. your data will get segmented by the logical statements which you construct). To begin creating advanced segments, navigate to the Advanced Segments pull down menu at the top left of your reports and select New custom segment. Identify the appropriate dimensions or metrics for your segment. Drag the dimension or metric into the field bordered by the dotted lines. Choose theÃÂ ConditionÃÂ appropriate to your segment (e.g. Greater Than, Equal To, etc). Enter the criteria for your segment (e.g. Pageview Greater Than 5). Click the appropriate tab to either insert the and statement OR the or statement. Or means an advanced segment that meets Condition A or Condition B. And means an advanced segment that meets condition A and Condition B.
Click Test segment to do a test run. Test segment will return results for each condition and for the segment as a whole. Provide a name to your segment in the field labeled Name segment. Click Create Segment to complete the process. You have an option to select multiple profiles to which you wish to apply your advanced segment. Tip: Before creating a customized advanced segment it is better if you first construct a logical statement based on what you wish to accomplish. You would like to segment your traffic based on high engagement levels. Assume that our criteria for high level of engagement includes Pageviews greater than 4 and Time on Site greater than or equal to 4 minutes. Accomplish this task using the advanced segmentation method. Navigate to the Advanced Segments pull down menu at the top of your report and select Create a new advanced segment. Drag the Pageviews into the field bordered by the dotted lines and set the condition to Greater than. Enter the value as 4. Click on the Add and statement link and drag the time on site metric into the field bordered by the dotted lines. Set the condition to greater thanor equal to and enter the value as 4. Click Test Segment to do a test run and provide a name (e.g. High Levels of Engagement). Click on Create Segment to complete the process. To manage your advanced segments, navigate to the gear icon pull down menu at the top of your reports and select Avanced segments. The management screen will appear, as shown in the following screenshot. Copy: If you want to build another segment based on an existing segment without affecting the original segment, then click copy next to the segment you want to build off of. Delete: Allows you to delete the existing advance segment. A regular expression is a set of characters and metacharacters that are used to match text in a specified pattern. You can use regular expressions to match a wide range of conditions. Assume that you would like to create a condition that will match the sources Google or Yahoo, regardless of whether or not Google and Yahoo are capitalized. Regex for this task is: ([Gg]oogle|[Yy]ahoo). The above advanced segment will output all the visits sent by Google or Yahoo! with New visits greater than or equal to 1.